Over 7,000 attendees have come from around the globe to take part in the biggest blockchain conference to-date. 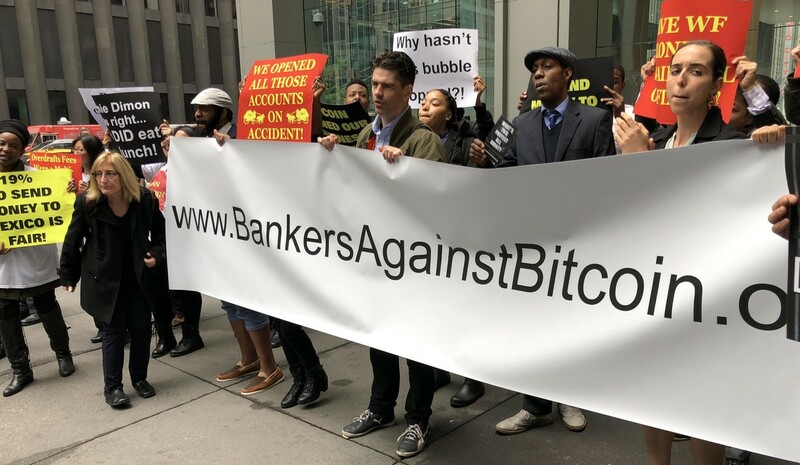 With dozens of amazing speakers, new tech being revealed, and a staged "Bankers Against Bitcoin" protest, the first day lived up to the hype. Fred Smith, chairman and CEO of FedEx, explained that one major issue that the logistic and transportation industry has faced is the "massive amount of friction" in cross-border logistics, since different countries have different standards, regulations and terminologies. He told the audience: "For cross-border shipments, 'trust' is legal requirement for every transaction. What blockchain has is a potential for the first time ever to make the information available for everybody." FedEx has launched a pilot program to establish what data would be needed for a distributed ledger to ease disputes between customers sending and receiving goods through FedEx. The shipping giant also wants to use blockchain to store its records. James Bullard, president of the St. Louis Federal Reserve Bank, stated cryptocurrencies "are creating drift toward a non-uniform currency in the U.S."
Although he told attendees that public and private currencies can "coexist in equilibrium" and even "facilitate transactions that might not otherwise occur," he also mentioned that, with 1,800 cryptocurrencies in circulation, there is a risk of drifting towards a time when consumers could find themselves having to hold multiple forms of currencies for different transactions, with each trading at a different relative price. When asked if government control was the only way to guarantee a stable monetary system, Bullard replied: "This century, the past century it's been true. Will it always be that way? I don't know. Maybe there are technological solutions." For the time being, he said, cryptocurrencies aren't a threat to the dollar's dominance because of their low transaction volumes. "The dollar's in great shape today," he said. "It will stay in great shape." "The drift to a non-uniform currency could become a serious issue for the U.S. if cryptocurrency reaches a large volume of trade." Future\Perfect Ventures founder and managing partner Jalak Jobanputra, ARK Invest CEO and chief investment officer Catherine Wood, and ConsenSys founding managing partner Kavita Gupta all agreed that U.S. regulators must move faster and provide more clarity in the crypto space, or risk having innovative startups look to friendlier shores. Wood struck a bullish note on blockchain, stating: "Almost everything that we're touching, blockchain will as well." Gupta and Jobanputra also discussed the opportunity for cryptoassets in emerging markets, notably in areas where smart phone penetration is connecting more users to financial services and other products in the digital economy. If PCs were Internet 1.0 and cloud computing was Internet 2.0, Muneed Ali, Co-founder of Blockstack, argues that Decentralized Computing in a blockchain world is Internet 3.0. Blockstack is helping to build this Internet 3.0. With Blockstack, you can develop apps without writing or running any servers, users own their own data, and data from one app can be shared with other apps. Amber Baldet's new startup is a blockchain decentralized application (Dapp) store called Clovyr. Clovyr will host a selection of well-vetted applications alongside some in-house developer tooling designed to simplify blockchain application development for enterprises. Baldet anticipates that tooling for data analysis on private datasets will be a popular product. "Currently privacy is seen as incompatible with data-driven insight, but that doesn't have to be the case." "Right now there's no way to keep data private at its point of origin and also enable big data analytics, but there could be," Nielsen said in a press release.